Let s check actual pictures from ongoing fair Light & Building in Frankfurt am Main. The fair will finish on 23th of March, so you still have chance to meet our OMS Team a get interesting information about our news in IoT technology. We are the first Slovak company, which present the IoT technology at Light & Building fair. Do not miss the chance to "experience" where the future of light is going! The light is not only light anymore. OMS has undergone significant changes over the last period. The company has gradually transformed itself into a technology-oriented company. What's awaiting us in the future of light will be presented to you at Light + Building 2018! What will be showcased? We will bring you the future of lighting in the cities, factories and also in the retail division. Our sales managers and IT specialists will show you how to easily control, record, maintain and fully use the lighting with their functionality. We will introduce you to the great benefits of our individual CitySys ©, WorkSys and ShopSys platforms. At our stand you will be able to feel and sense the readiness of our IoT luminaires. Street lights such as DALYA with motion sensors and an integrated camera will show you the ease of connectivity with our CitySys ©platform. Do you dream about belonging to SMART cities? Take a unique opportunity to meet our Smart City Pole and Smart Public Pole as first! The poles are loaded with various features from charging, weather monitoring, even to camera scanning and they will be introduced on Light + Building 2018 for the first time! Simple integration of IoT ready industrial lights as GHADA with our WorkSys platform will bring you into the Smart Industry. Let us become the part of something new. The built-in sensors for human motion assessment, noise measurement, and air quality measurement are just a few of the functionality that we'll introduce you to through our IoT luminaires and platform. The remote control of lights and their remote monitoring is one of the most exciting things, showing their function in simple and efficient ways. The last but certainly not least, very interesting is our Smart Retail Zone. We will introduce the functionality of the ShopSys platform together with our "miraculous" products. When set up and in place, this lighting can boost sales revenue and campaign targeting? Thanks to our platform and its interconnection with IOTs such as ELYS Track, this requirement will be a breeze! The sensors in the luminaires allow you to detect people by gender and age, they can tailor lighting to highlight the products you feel will be of interest. This is just a fraction of the functionality offered by ShopSys. We will also introduce other wonderful ways for your Smart Retail through the Dynamic Shop Window and Smart Mirror products. Thanks to the Dynamic Shop Window, we will show you how to set the interpretation light as you need with a touch panel. The adjustable light composition, energy-saving motion detection, and other features make you a top-of-the-line designer. With both products together, you will have the opportunity to give the customer a truly "unique shopping experience". Are you interested in what we have to offer at L + B? And that's just a little insight of what's waiting for you! The whole OMS team is looking forward to meet you at HALL 4.2 STAND F10. For more information about our products, download OMS Stand description. Spiker, the award winning luminaire by OMS. 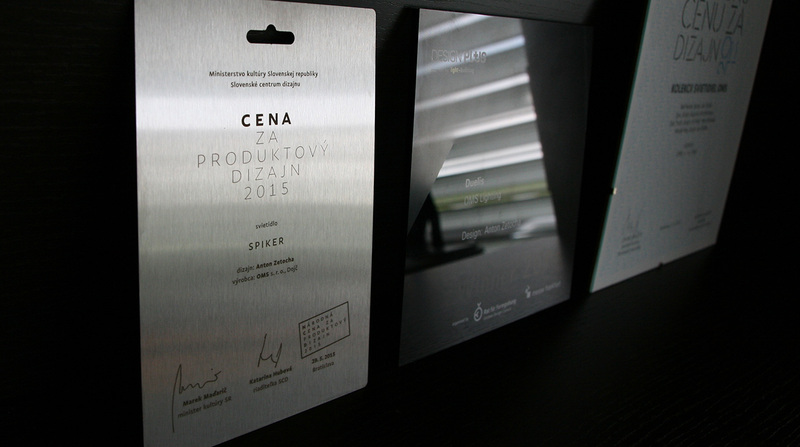 On 29th May, the Slovak Design Centre announced the winners of the National Design Award 2015 competition at the award ceremony in Bratislava, Slovakia. Spiker, designed and manufactured by OMS, was awarded in the Product Design category. The GreenLight Programme is an EU action, run by the DG Joint Research Centre of the European Commission. The goal of the programme is to encourage non-residential electricity consumers to install energy efficient lighting technologies in their facilities, preventing pollution and improving the lighting quality. Every year the EC JRC organizes the GreenLight Award, where the most interesting projects in terms of energy savings and technology innovation are awarded. This year 5 winners of the Award were selected, representing the best projects implemented the previous year. For 2013, OMS Lighting was one of the winners for the new energy efficient lighting system in their own facility. OMS would like to lead by example as a lighting company highly committed to promote the goals of the programme. The award ceremony took place at the Portalhaus building during the Light + Building on Tuesday, 1st April 2014, where Gabor Wein, Energy Saving Manager of OMS had received the award. Beside the OMS exhibition stand, you had a chance to see award-winning DUELIS presented at several places at the Light+Building trade fair in Frankfurt, Germany from 30.3.–4.4.2014. DUELIS is a product representing an ideal harmony between minimalistic design and technical prowess, what was recently recognised in the Design Plus powered by Light+Building competition. DUELIS became one of 36 products to earn this prestigious design award, a seal of quality for products demonstrating future viability, innovative design and energy-efficient technology. DUELIS, selected by a highly qualified jury of experts from 238 entries, will be displayed in a special exhibition for competition winners during Light+Building 2014 in Hall 1.1, stand E51. DUELIS is the work of our award-winning in-house designer Anton Zetocha, who wished to create the ultimate minimalist design where the shape of the housing was barely affected by the contained components. What this results in is an extremely streamline form with strong yet subtly sweeping lines that flow over the 35 mm thick central electronic area to the two 14 mm thick optical parts to either side. Such weightiness dimensions create the impression that DUELIS is floating in space, allowing it to be a stylish and elegant addition to any aesthetically focused space. Customisable with any colour combination, pattern or finish, DUELIS can blend into any room design perfectly. Providing the highest quality illumination, a key feature of this award winning luminaire is its provision of both direct and indirect light distribution. DUELIS can be supplied with predominantly direct or indirect illumination, allowing you to choose what is most suitable for each particular space. Additional to delivering psychologically beneficial illumination, DUELIS ensures high levels of visual comfort and acuity thanks to the specially designed diamond microprismatic optical system. With an office friendly glare rating of UGR ≤ 19, and perfectly homogenous light distribution, this luminaire is ideal for use in areas where display screens are used and in locations where visually demanding tasks are performed. Constructed using the highest quality materials and methods, such as state-of-the-art self-cooling LED modules and a solid aluminium body, this luminaire takes lighting to a new level. With an optimal system efficacy of 87 lm/W, combined with a long and maintenance free lifetime, you can trust DUELIS to retain its appearance as well as deliver perfect and energy conscious illumination for many years into the future. With DUELIS, OMS will also participate in the Architecture and Technology Prize for Innovation 2014, which rewards products and conceptual solutions that impress both in terms of their design quality and their technical ability. DUELIS will be one of the projects presented also as part of a special display during Light+Building 2014 in Hall 3.1, stand D40. Read more about the luminaire from the designer’s point of view on ourdesign blog. OMS Lighting recently showcased industry leading lighting solutions for the retail sector as one of the foremost exhibitors at EuroShop 2014. “Our exhibiting at Euroshop 2014 marked the successful entry of OMS Lighting into the retail market. The highlight of the event was the introduction of our retail psychology philosophy, which put into practice significantly increases the added value of modern LED-based lighting solutions. Through the use of innovative control systems and customised user interfaces, we can achieve a higher level of lighting that can quickly and flexibly adapt to customer need. Throughout the event, OMS lighting trend experts explained and demonstrated the retail psychology philosophy, giving more than 300 presentations showing the positive effect lighting has on purchasing behavior and the benefits it brings to retailers. For those visiting our stand it was clear, a new era in retail lighting has just begun,”said Manfred Raffler, COO, OMS. OMS Lighting will showcase its industry leading lighting solutions for the retail sector as an exhibitor at EuroShop 2014, “The World’s Leading Retail Trade Fair”. From February 16-20 in Düsseldorf, Germany. You are welcome to meet OMS representatives at Stand G73 in Hall 11. With the theme, “Lighting Psychology for Retail Success”, OMS invites the world’s largest retail brands, renowned lighting designers and architects to experience the powerful impact the Right Light has on retail success. OMS will present retail lighting solutions for applications including accent, dynamic and shelf-level lighting and lighting trends, all with a focus on lighting psychology in retail. Discover how OMS products ZIPAR TRACK, AVIOR TRACK and COMET MOTIONcan provide perfect accent lighting. Learn how AVIOR MOTION, ZIPAR MOTION RECESSED and AVIOR SURFACED can be used to create dynamic lighting and draw attention to shop windows. Explore how TARF ADJUSTABLE and LED strips can define shelf displays. 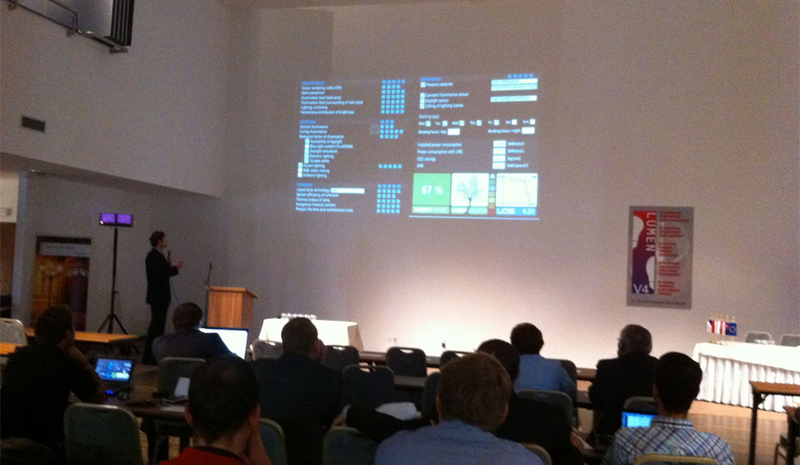 June 1-30, 2013, Bratislava, Slovakia. 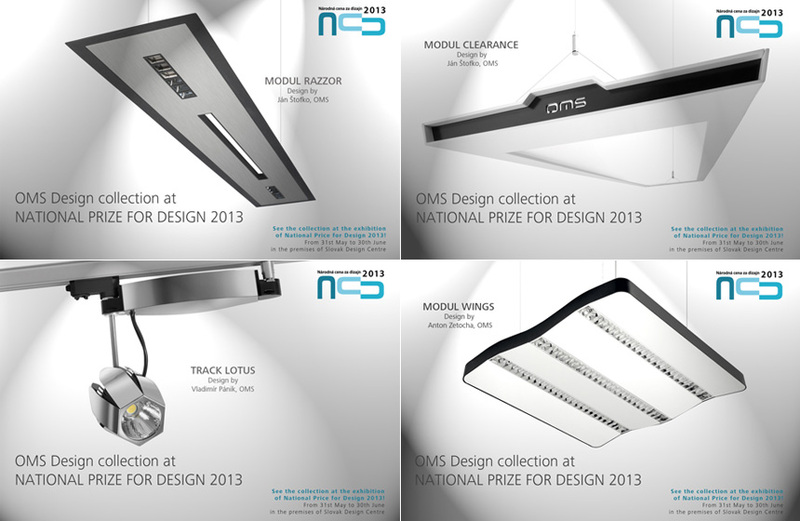 OMS design collection participated in the 11th Annual National Prize for Design and is included in the exhibition of awarded and selected works NPD 2013. The ceremony announcing the results of the National Prize for Design for the year 2013 was held on May 31 in Bratislava. The competition is organized biennially by the Slovak Design Centre and the Ministry of Culture and represents the most important award for design in Slovakia. OMS is the winner of the previous annual competition and holds the National Prize for Design 2011 in the product design category. 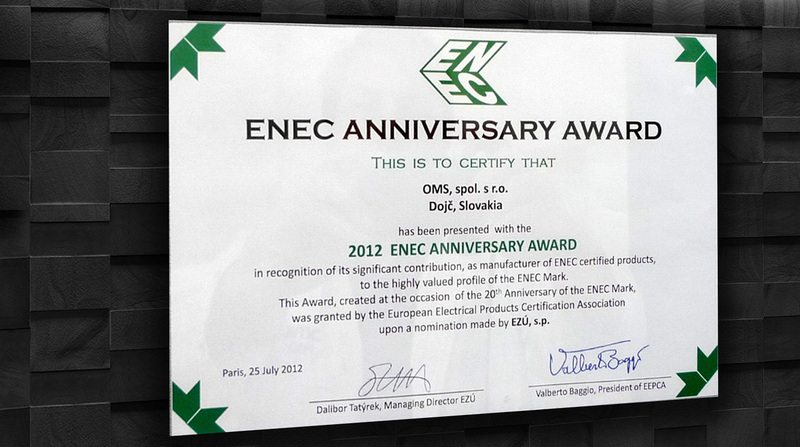 OMS design joined also this year's edition of the award. Track Comet, Modul Clearance, Track Lotus, Modul Wings and Modul Razzor luminaires designed by Anton Zetocha, Ján Štofko and Vladimír Pánik are presented at the awarded and selected works of NPD 2013 exhibition. We cordially invite you to visit this design exhibition. The exhibition of the NPD 2013 competition results is open to the public in Satelit Gallery in Bratislava´s old town center by the end of June 2013. Competition results and more info here. The Israeli Committee for Lighting Engineering March 6th 2013, Tel Aviv, Israel. The Israeli Committee for Lighting Engineering March 6th 2013, Tel Aviv, Israel. Focused on the introduction of its LQS philosophy, OMS’ presentation at the lighting conference in Tel Aviv was very successful. “Innovation in lighting” was the theme of the 60th annual lighting convention, organized by The Society of Electrical and Electronics Engineers in Israel.. The lecture given by representatives of OMS’ R&D department introduced the LQS concept, its methodology and the LQS composer software., Immediately following the lecture, OMS’ booth attracted a large crowd of professionals from the lighting field including lighting designers, planners, suppliers and wholesalers—all of whom were interested in learning more about the LQS philosophy, as well OMS’ products and technology. March 5-10, 2013, Nitra, Slovakia. OMS will illuminate exhibitor booths at the international "Furniture and Living 2013" trade show, which will take place from March 5-10 at the Agrokomplex exhibition centre in Nitra. The exhibition will feature new trends and technology in furniture production, young design talents, as well as international furniture companies. The trade show will be illuminated by OMS LED luminaires including Track Cube, Downlight Seeller, Track Avior Advanced and others. 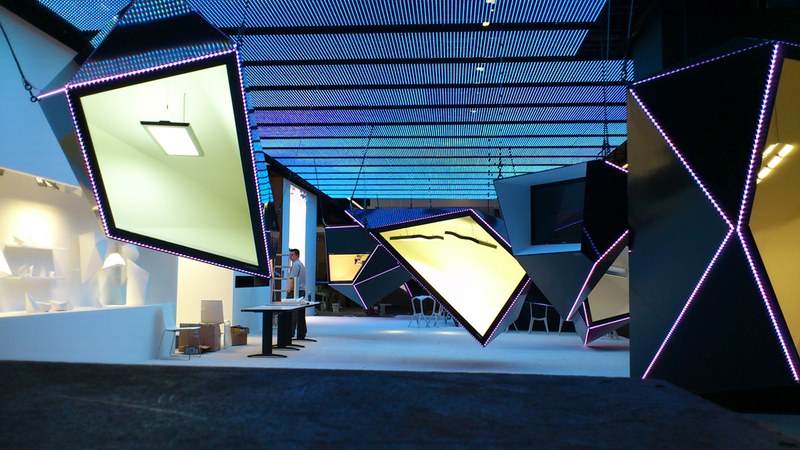 These luminaires will be showcased in exhibition pavilion M5. 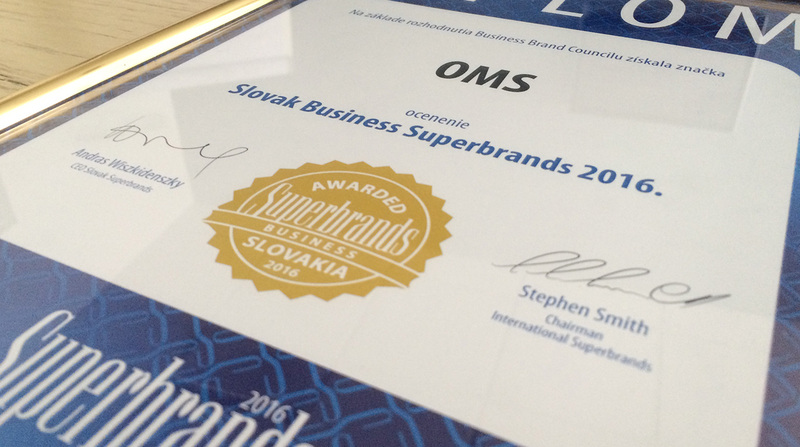 Vladimír Levársky, CEO of OMS became the Slovak Entrepreneur of the Year. The founder of the industrial and office luminaires producer from Dojč, near Senica, received the award from Stan Jakubek, Ernst & Young’s head partner for Slovakia and representative of the awards committee, during a special ceremony. The jury of the Ernst & Young Slovak Entrepreneur of the Year Awards for 2012 was chaired by last year’s winner, Ľuboš Fellner, founder of Bubo Travel Agency. "I would compare this to the Champions League group stage. I did not manage to get this far in football," said Levársky, a former football player and current owner of the FK Senica Club, to TREND magazine. The decision to crown Levársky this year’s winner was quick and clear according to Fellner. “As Entrepreneur of the Year, Levársky is an example of a person who wants to be the best at what he does and knows perfectly the art of business – he is more a businessman and a marketer than a technician. His company has been successful on a long-term basis and internationally. It has been focused on the development of new technologies and is also an important employer in its region.” The jury Feller led considered almost 40 candidates. The criteria for evaluation included the entrepreneur’s personality and story as well as strategic orientation, national and international scope of activities and also financial results. OMS’ Anton Kozubík will introduce the company’s Lighting Quality Standard (LQS) at LuxLive together with LQS creator, Michal Jancuska. LQS takes a holistic approach which combines technical and biological aspects of lighting as well as visual well-being. The OMS lighting truck will arrive at LuxLive on November 6th and stay until November 7th. The truck will present OMS’ latest LED Solutions including its new Lighting Quality Standard (LQS) and its companion software program, Lighting Quality Standard Composer which provides unprecedented project support for architects, designers and engineers. You are invited to participate in a presentation and speak to the OMS team. For invitations and details, please contact katarina.podeslova@oms.sk, zuzana.masarova@oms.sk or jana.zifcakova@oms.sk. October 6th 2012, Brussels, Belgium. On October 6, 2012, leading EU employers converged in Brussels to meet prospective job applicants and introduce them to their companies’ latest job opportunities. 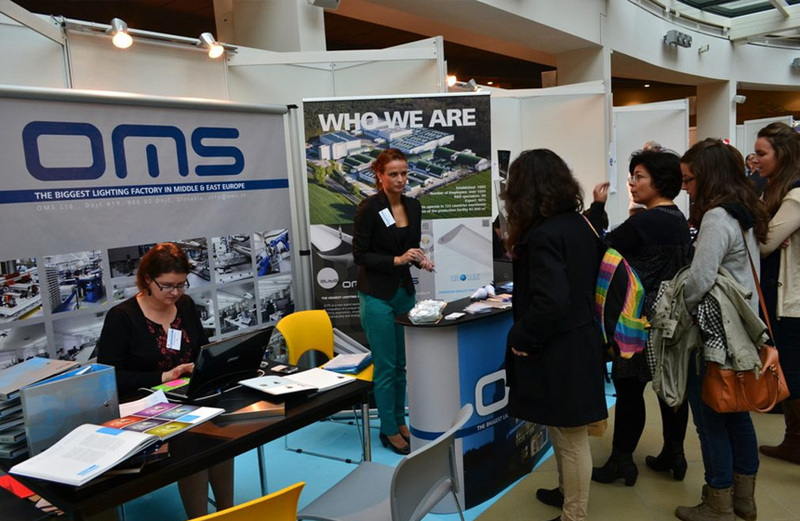 Prominent luminaire manufacturer and technology innovator, OMS, took part in the European Job Day as the only Slovak employer. European Job Day is aimed at increasing employment by providing employers and job applicants in the EU member states the opportunity to network. OMS’ Erika Kratochvílová (HR manager) and Veronika Blízková (executive assistant) met with prospective job applicants. September 26-28, 2012, Bratislava, Slovakia. 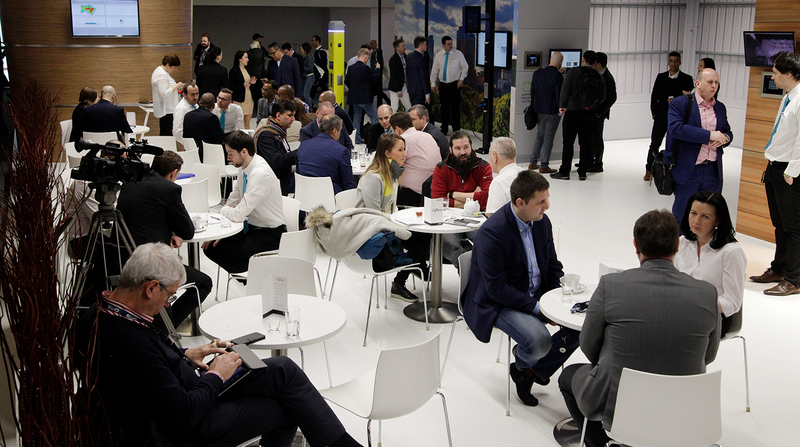 Leading lighting industry representatives from the V4 countries (Slovakia, Hungary, Poland & Czech Republic) came together to present and discuss the industry’s latest technological and product innovations. The OMS Project "Design of illumination in the Basilica of Our Lady of Sorrows in Sastin" featured in SVETLO magazine 05/2012 (pages 8-10).